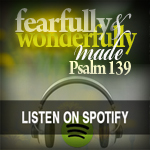 Scripture Songs for Worship : Psalm 139:1-18 Song "You Have Searched Me and Known Me"
Psalm 139:1-18 Song "You Have Searched Me and Known Me"
So lovely! Please, do you have the sheet music for this Psalm/song? so lovely! Do you have the sheet music for this particular psalm/song? Would like to have to play personally on my guitar. Thanks! Hi Edna, sorry for taking so long. 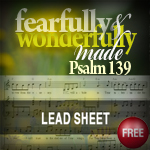 I've just uploaded the lead sheet. What a treasure trove this website is! I happened to leave my Youtube music on auto play while listening to some sermons and your music came on at the end of it. I have greatly enjoyed each song so I decided to check out your website. Thank you for putting this together; you are each a vessel of blessing. May Abba honor you greatly and continue to use you for His greater glory in Jesus' Name. Shalom!